Gold and Treasury Bonds have supposedly been “safe havens” in which to park capital if an investor believed the world was about to collapse economically…My own, long held view has been that Europe is NOT going under and the Global Economy is just fine…that we are, I believe, at the beginnings of a planet wide economic and technological BOOM...and pretty soon (like immediately) the “collapse” we are going to see will be in Gold and Treasury Bonds, not the world economy. In spite of all the media hype during last year’s 4th quarter, particularly centered on interpreting every hiccup in Europe, Gold actually made its all time high on September 6, and Treasury Bonds followed with their all time high on September 23rd…and they essentially have been in wide swinging consolidations ever since…both failing to ever make new highs again during what I believe was the absolute peak of “Eurofear” in November, when we heard all the claptrap about Italy being next on the bankruptcy list…Remember that?...All the bunk about Italy’s 10 Year Note being at 7% meaning Europe was definitely DOA? 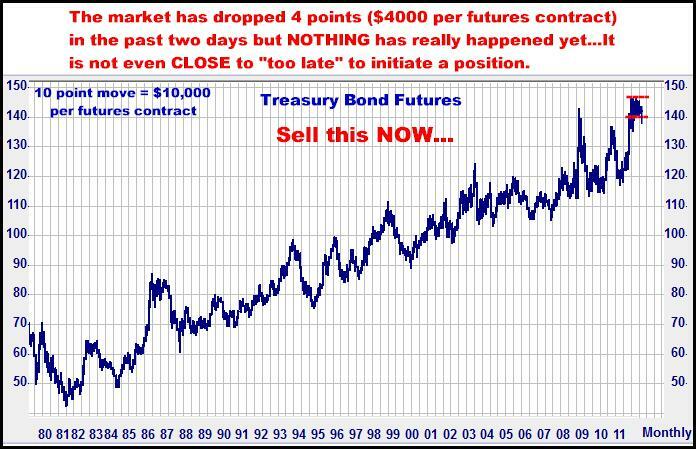 Well, the world didn’t fall apart…and isn’t going to…and with economic signals getting stronger and stronger…the case for Bonds in the 140’s, and Gold at today’s $1650, just doesn’t make sense…AT ALL. I think they both are grossly, grossly over-priced, and after six months of sideways action, are now in the early stages of declines that will be breathtakingly large (especially if you own them) and unceasing for the balance of 2012. Both Treasury Bonds and Gold (especially) achieved their stratospheric price levels based on nothing more than worldwide FEARS…and in my 32 years of sitting in this chair, I firmly consider last fall, with every other TV Yaphead on the planet seemingly predicting the END of civilization as we know it, as the BIGGEST (supposedly) CRISIS to which the markets have ever been subjected in decades….AND….That sh*t is now in the rearview mirror…The fear thing has been taken as far as is could possibly have been taken…and now that it’s over, BONDS AND GOLD ARE TOAST. Yes, there will be bumps and concerns (as there always are) but they will be nothing compared to what we have been through in recent years. 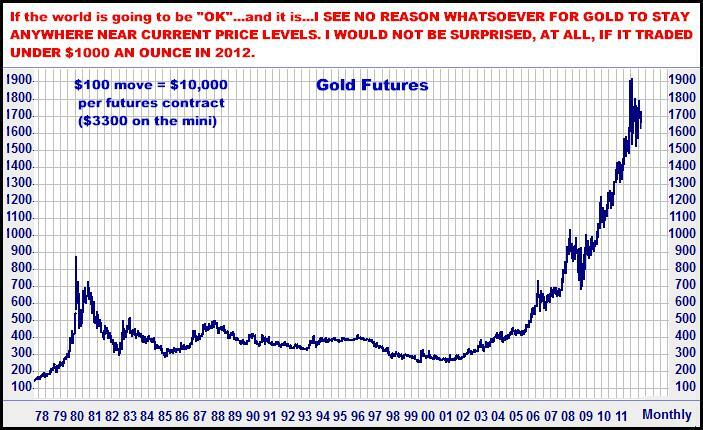 I THINK GOLD WILL GO DOWN FOR YEARS…AND I ASSURE YOU, TO BEGIN WITH, TRADING UNDER $1000 DURING 2012 IS A DISTINCT POSSIBILITY. I’ll be brief…You’ve heard all the talk everywhere, and spoken with such absolute CERTAINTY, that Gas is headed for $5.00? Like it is totally a foregone conclusion? 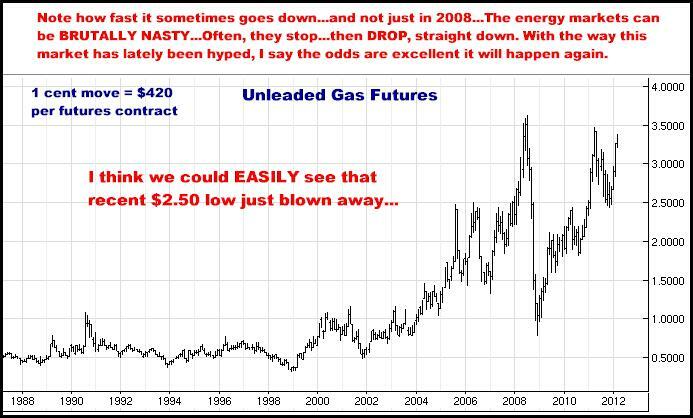 How we’re “headed for the driving season” and there is nowhere for gas prices to go but up? Bull!!! No I don’t know for sure what is going to happen but I can tell you I’ve seen this same scenario touted MANY times in my career…The story usually comes along about March or April, and they talk about “tight stocks” and “summer blends” and “the economy picking up”, all of it leading to one conclusion: Gas prices will be going up, up and away for the next 3-4 months (at least)…BUT, let me tell you…It doesn’t always happen like that…I have seen many years where prices did nothing (basically) but go DOWN right through the summer…which is exactly what I think is coming this year. Yes, I know there is a lot of talk about Israel bombing Iran and then Iran closing the Straits of Hormuz…and all the talking heads taking that possibility and swearing this leads to $250 Crude and who knows what in Unleaded prices…BUT (again), I do not think anything like this is going to happen. They are not idiots in Iran, neither are the Israelis and neither are we, and I am relatively certain there is all sorts of behind the scenes peace oriented diplomacy going on that has not yet become public…and…the Middle East is NOT about to blow up…I could elaborate on more of my reasoning as to why but I’ll save that for anyone who wants to talk about it on the phone…I will say, though, as an old hack futures broker who has seen various market reactions to any number of conflicts, that it is NOT axiomatic that military activity in this case would lead to sharply higher oil prices. Believe me, it is possible that if “shots get fired”, Oil might just go DOWN and NOT up. These are the futures markets. They anticipate…then they anticipate again…which often means mouths fall open as the market does exactly the opposite of what the masses are expecting. 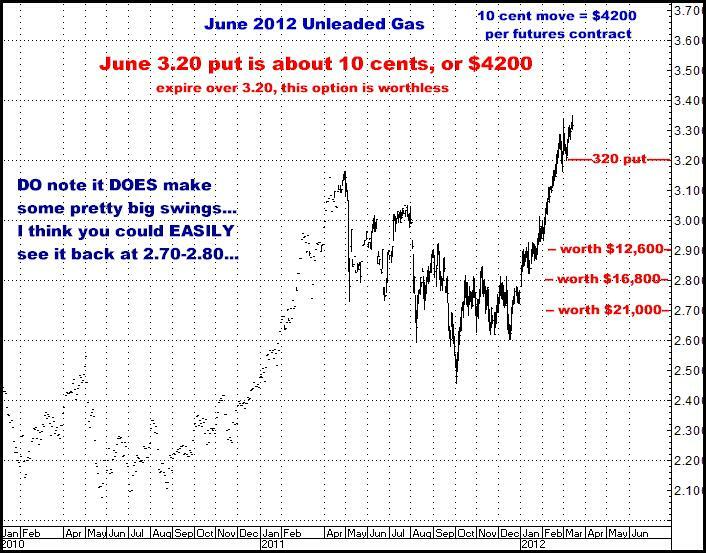 I think Unleaded Gasoline has been artificially pumped up to an extreme, and if there is even a hint of conciliation in the Middle East…or even if we go much longer at all with no fireworks, I look for Unleaded to positively FALL OUT OF BED…More and more, today’s markets seem to be about GIANT, FAST moves and I believe this market is, here and NOW, an excellent candidate to do precisely that. I absolutely believe we could see a $1.00 per gallon drop in Unleaded prices during the next 2-4 months. I started buying puts on this market today. I see ANY down day as potentially the beginning of a VERY sharp sell off.